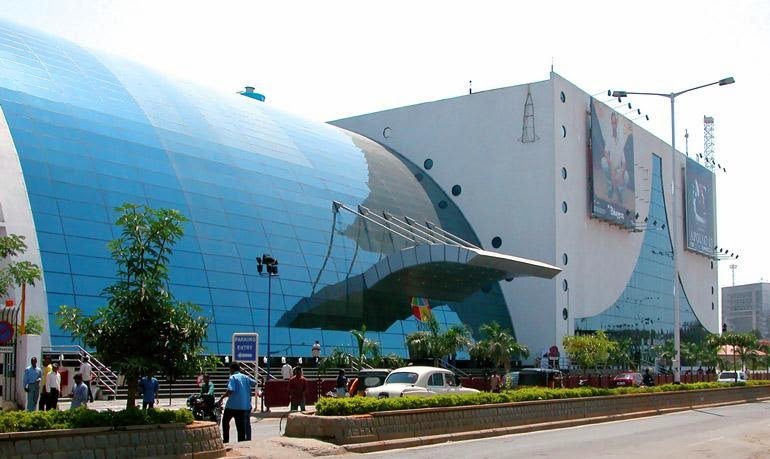 Prasads IMAX of the L. V. Prasad group, was inaugurated on July 25, 2003.Prasad's IMAX is a centrally Air Conditioned multiplex of an area of 2,35,000 sq ft, housing an IMAX Movie Theatre, a five screen multiplex, food court, multinational fast food outlets, a gaming zone and a Shopping mall covering two levels of the complex. It is India's 1st IMAX theater. It is also the single most popular IMAX theater in the world. Its 72-foot high, 95-foot wide screen is accompanied by 635 seats and a 12,000-watt sound system. It is the largest IMAX 3D screen in the world The biggest normal screen is at the Sydney IMAX theatre. (123 x 97 ft).But Prasads IMAX has outshown it with 3D technology having the largest screen in the world. The Prasads IMAX made its name by being the most attended screen in the world for major blockbusters like the Harry Potter and Spiderman movies. In May 2011, Prasads became the first Green theatre in India by installation of a 100KWp Solar PhotoVoltaic power generation system on its rooftop.